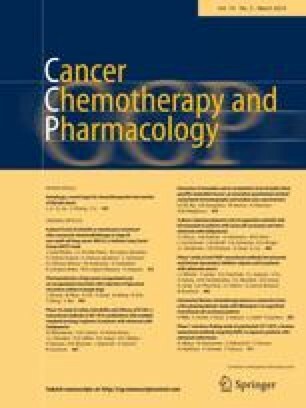 A total of 32 evaluable patients with measurable advanced colorectal carcinoma were treated with continuous-infusion alpha-difluoromethylomithine (DFMO) at a median daily dose of 8 g/m2 (range, 6–14 g/m2). DFMO was infused over 24 h daily for 28 days, followed by a rest period of 7 days. Of the 32 patients, 14 had received no prior chemotherapy. A total of 65 courses was given, with the median being 2 (range, 1–9 courses). None of the patients achieved a partial or complete response; however, 3 patients achieved a minor response and 14 had stable disease. The frequent toxic effects of DFMO included thrombocytopenia (which was dose-limiting), malaise, nausea, vomiting, reversible hearing loss, and diarrhea. Our data suggest that continuous-infusion DFMO therapy is feasible and results in only mild gastrointestinal toxicity. Although DFMO proved to be ineffective as a single agent in this trial, it could probably best be used in combination with cytotoxic agents known to enhance its antitumor activity in a preclinical setting.